Conjunctivitis, often referred to as pink eye, is a common condition that causes the inflammation of the surface of the eye, and the tissue that surrounds it. Approximately 1 out of 100 people will contract the disease each year. The symptoms include sensations of pain, burning, and itchiness, and a red or pink appearance of the affected eye. There will also likely be mild swelling, as well as a light fluid discharge, which can dry and become crusty over night. This can cause the infected eye to become sealed closed in the morning, but this can be remedied with the application of a warm, damp cloth. Nearly all cases of conjunctivitis will clear up in one to two weeks time. In the even that the symptoms continue to worsen, or have not reduced in that period, it's possible that another condition is causing them, and that the diagnosis of conjunctivitis was inaccurate. Some fungal and microbial infections can exhibit similar symptoms at first, which may not differentiate themselves until sufficiently developed. It's always important to seek out professional medical attention any time there is an eye-related health problem. Conjunctivitis is an inflammation of the conjunctiva, a thin, transparent layer covering the surface of the inner eyelid and the front of the eye. It affects people of all ages. More often than not, conjunctivitis is caused by a viral infection, however a bacterial form of the disease also exists. It's even possible for it to be triggered by common allergens, such as pollen or animal dander. However, allergen-triggered (seasonal allergic conjunctivitis or hay fever) forms of the disease aren't transmittable from person to person, while those caused by either a viral or bacterial infection are highly contagious. There are several different viruses that can cause conjunctivitis, the most common being adenoviruses. One of the most serious forms of conjunctivitis is caused by the herpes simplex virus, the same virus that leads to cold sores in and around the mouth. A less common, but quite serious form, called acute hemorrhagic conjunctivitis, is caused by enteroviruses, and was only first discovered in 1969. It's potentially the most contagious form of the disease, and has caused several large epidemics throughout the world since its discovery. As a group, bacterial forms of conjunctivitis are less common that viral forms, however not so much as to be considered rare. Much like the viral category, the bacterial form is also caused by several different pathogens. The three most common of them are Staphylococcus aureus, Streptococcus pneumoniae, and Haemophilus influenzae. It's possible for these forms of the disease to last much longer and possible even become chronic. However, with proper treatment of antibiotics, these are also the most curable forms of conjunctivitis. Even less common than bacterial infections are allergen-triggered forms of conjunctivitis. These can be caused by any substance, biological or chemical. Pollen, animal dander, perfumes, make-up, dust, skin mites and even certain types of eye drops can cause a sever allergic reaction. While not at all contagious, this form can be difficult to treat if the allergen that's triggering the condition isn't known. If it is, eliminating it from the environment is an important step in treating the symptoms. to look for, also, such as mild swelling of the eye and its surrounding tissue, as well as a burning or itching sensation. These are apparent in all forms of the disease, no matter the individual cause. Conjunctivitis does not affect visual acuity at all, nor the reactivity of the pupil. There are other symptoms that each of the three forms of conjunctivitis is individually associated with. Viral conjunctivitis is often seen in conjunction with signs of upper respiratory infections, or the common cold. The eyes are typically more watery than in other forms, and while it may only start with one eye, it can very easily spread to the other. Compared to the redness caused by other forms, viral conjunctivitis is typically a mild pink, and cause for the common name of pink eye. Bacterial conjunctivitis develops very rapidly, and causes a very red appearance on the eye. There is more swelling and discharge, also. This discharge is what causes the dry crust that often hold eyelids closed, especially in the early mornings. 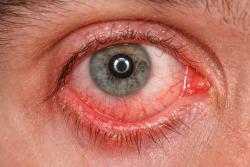 While the bacterial form is less likely to spread from one eye to the other than the viral form, it is still common, is may take 3-5 days to occur. There may even be sensations of a foreign body on the eye, but this is almost always caused by the infection itself. Symptoms of allergen-triggered conjunctivitis are more varied from patient to patient. While all of the base level symptoms are likely to be present, including red, watery, itchy eyes, their levels can vary in relation to one another. One person may have very red eyes that only itch a little, while another have little to no redness, but high levels of watery discharge and itchiness. This is primarily due to the individual nature of allergic reactions, as well as the wide range of possible allergens than may trigger the condition. The recommended treatment of conjunctivitis is dependent on its type. Viral forms usually resolve on their own in less than a week. Medications like antihistamines can be taken to minimize the symptoms, but will do nothing to treat the actual infection. Bacterial forms will also recover on their own, usually in less than a week. However, with antibiotic eye drops the recovery period will likely be several days shorter. For allergic conjunctivitis, a combination of antihistamines to treat the symptoms and elimination of the allergen from the environment will help. Unlike the infectious forms, allergic conjunctivitis won't resolve on its own, and may persist as long as the patient is exposed to the offending allergen. Regardless of the form, anyone suffering from conjunctivitis that regularly wears contact-lenses should remove them for the duration of the disease, and dispose of the lenses that were worn when symptoms began to show. It is important to also replace the storage case, as the infection will still be in it. The possibility of reinfection is high if the lenses are re-used, and wearing them during the infection will cause the infection to worsen drastically. Wash your hands regularly, especially after coughing, sneezing, or shaking hands with other people. Avoid touching your eyes as much as possible, and practice safe contact-lens wearing habits. Remove them as recommended, wash them before and after storing them, and replace them as intended. Never swim or bathe while wearing contact lenses. Allergen-triggered conjunctivitis isn't communicable, so hygiene plays less of a role in its onset. Instead, speak with your doctor about your personal allergies, and what methods work best for limiting both their symptoms, and your exposure to them. Red, watery eyes, inflamed inner lids, blurred vision and a sandy or scratchy feeling in the eyes may indicate that you have conjunctivitis. Pus-like or watery discharge around the eyelids may indicate an infectious form of the disease, commonly known as "pink eye."